A stands for atom; it is so small No one has ever seen it at all. So, brother, do not be too fast on the trigger. H has become a most ominous letter. It means something bigger if not something better. 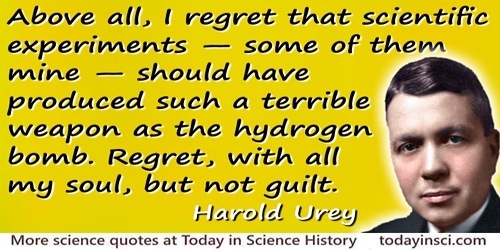 Above all, I regret that scientific experiments—some of them mine—should have produced such a terrible weapon as the hydrogen bomb. Regret, with all my soul, but not guilt. Quoted in 'Moon-Struck Scientist,' New York Times (27 Apr 1961), 42. Deep beneath the surface of the Sun, enormous forces were gathering. At any moment, the energies of a million hydrogen bombs might burst forth in the awesome explosion…. Climbing at millions of miles per hour, an invisible fireball many times the size of Earth would leap from the Sun and head out across space. I am very unhappy to conclude that the hydrogen bomb should be developed and built. In 'Should America Build the H-Bomb', Bulletin of the Atomic Scientists (Mar 1950), 73. I got a four year scholarship to Harvard, and while I was there they wanted to groom me for work in the Star Wars program designing weapons ignited by hydrogen bombs. I didn't want to do that. I thought about how many scientists had died in World War II. Quoted in Nina L. Diamond, Voices of Truth (2000), 326. I happened to read recently a remark by American nuclear physicist W. Davidson, who noted that the explosion of one hydrogen bomb releases a greater amount of energy than the explosions set off by all countries in all wars known in the entire history of mankind. And he, apparently, is right. Address to the United Nations, New York City, 18 Sep 1959. Quoted in 'Texts of Khrushchev's Address at United Nations and the Soviet Declaration', New York Times (19 Sep 1959), 8. It is true that I am the father [of the H-bomb] in the biological sense that I performed a necessary function and let nature take its course. After that a child had to be born. It might he robust or it might be stillborn, but something had to be born. The process of conception was by no means a pleasure: it was filled with difficulty and anxiety…. As quoted in Robert Coughlan, 'Dr. Edward Teller’s Magnificent Obsession', Life (6 Sep 1954), 72. Parliamentary debate concerning the hydrogen bomb (Nov 1953). In Robert Rhodes James, ed. Winston Churchill: His Complete Speeches, 1897-1963 (1974), Vol. 6, p.8505. The fact that no limits exist to the destructiveness of this weapon [the “Super”, i.e. the hydrogen bomb] makes its very existence and the knowledge of its construction a danger to humanity as a whole. It is necessarily an evil thing considered in any light. For these reasons, we believe it important for the President of the United States to tell the American public and the world what we think is wrong on fundamental ethical principles to initiate the development of such a weapon. Enrico Fermi and I.I. Rabi, 'Minority Report of the General Advisory Committee', United States Atomic Energy Commission: In the Matter of J. Robert Oppenheimer: Transcript of Hearing before Personnel Security Board, Washington, D.C. April 12th 1954—May 6th 1954 (1954), 79-80. The fate of human civilization will depend on whether the rockets of the future carry the astronomer’s telescope or a hydrogen bomb. Concluding remark, BBC Reith Lecture (30 Nov 1958), 'Astronomy and the State', published as The Individual and the Universe (1959, 1961), 73. The pace of science forces the pace of technique. Theoretical physics forces atomic energy on us; the successful production of the fission bomb forces upon us the manufacture of the hydrogen bomb. We do not choose our problems, we do not choose our products; we are pushed, we are forced—by what? By a system which has no purpose and goal transcending it, and which makes man its appendix. The pursuit of the good and evil are now linked in astronomy as in almost all science. … The fate of human civilization will depend on whether the rockets of the future carry the astronomer’s telescope or a hydrogen bomb. In BBC Reith Lecture (30 Nov 1958), 'Astronomy and the State', published as The Individual and the Universe (1959, 1961), 72. In A Passion for Science edited by L. Wolpert and A. Richards (1988). The scientist is not responsible for the laws of nature. It is his job to find out how these laws operate. It is the scientist’s job to find the ways in which these laws can serve the human will. However, it is not the scientist’s job to determine whether a hydrogen bomb should be constructed, whether it should be used, or how it should be used. This responsibility rests with the American people and with their chosen representatives. In 'Back to the Laboratories', Bulletin of the Atomic Scientists (Mar 1950), 6, No. 3, 71. Quoted in L. Wolpert and A. Richards (eds. ), A Passion for Science (1988), 9, but incorrectly attributed to Robert Oppenheimer. As given by in Robert Coughlan, 'Dr. Edward Teller’s Magnificent Obsession', Life (6 Sep 1954), 70.